I was recently talking to Terry Teoh from Deloitte in Wellington regarding some of the challenges in setting up a Programme Management Office (PMO). It was a very interesting discussion, which he kindly agreed to have published as a blog post. The first challenge Terry identified is the one of lack of stakeholder buy-in at leadership level. It is imperative that the PMO lead constantly weaves in the business benefits of the PMO approach – i.e., why are we doing this? This needs to be done at the leadership and management levels. This paves the way for team members to work effectively with project teams at the delivery level. To be effective, the PMO also needs to constantly articulate the benefits of the process to the programme teams as well – i.e., why would filling out this report for the governance meeting help? Another challenge identified was the one of the PMO being an administrative function. It is critical that the scope of the PMO includes activities that provide strategic and governance value. This can be delivered by ensuring PMO is responsible for frameworks and programme structures, methodology and metrics for performance measurement, integrated views of work plans and dependencies and budgets and capability development for governance of projects and programmes. As soon as a PMO gets a reputation as chaser of reports, their value becomes questionable. Flexibility of process and approach was identified as another key challenge. The worst approach a PMO can take is a text-book one where a “thou shalt do” culture exists. Approach needs to be tailored to suit the organisation and its culture. The effort of support and hand-holding necessary at the beginning of establishing a PMO to ensure people understand and do things correctly, is often underestimated. This also enables the PMO to recognise how to enhance and tailor the process and provide guidance along the way. The last major point of discussion was the necessary skills within the PMO staff. One comment Terry made that resonated well with me is the fact that the worst PMO staff you can get are the ones that have done PMO work all their life. PMO requires expertise in a range of fields that directly relate to the programme and the projects it is likely to commission – IT management, financial management, project planning and control etc. This also enables the PMO to put themselves in the other person’s shoes with the right perspective. Without this, success is difficult to achieve. 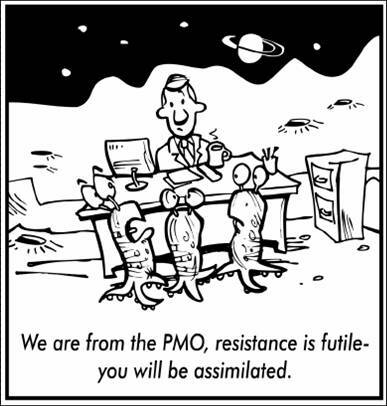 I’m keen to hear what challenges you have faced in establishing PMOs.